There are quite a few figures that I just can’t part with, even if they’re put away in the closet. I’m sure many of you have the same problem. My own personal solution? Cycle them ocassionally. I’ve done it once or twice already, and it’s always fun, and your shelves never look boring. I like re-arranging my figures so they have a theme, or some sort of cool looking composition, or maybe I feel like “featuring” one particular figure, and place her under the spotlight. As such, I’ve decided to document how my collection changes over time. This would be the second time I’ve taken photos of my own collection. 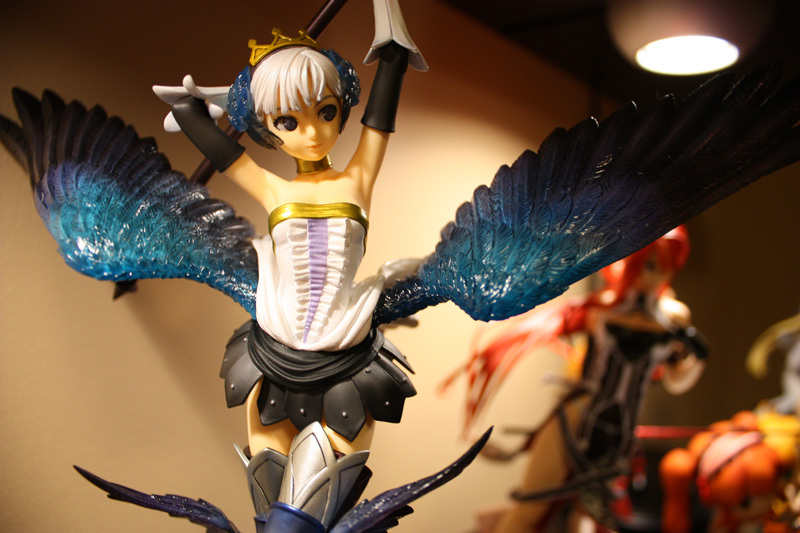 My current favorite in my collection, is the beautiful and elegant Gwendolyn, from Odin Sphere. Manufactured by Alter, she’s 1:8 scale. A beauty to behold in a full-length shot. Hopefully I’ll have time to review her in depth at some point. Besides the beautiful Gwendolyn, I also purchased the Human Mage from Lineage II. Interesting, she looks a lot sexier than I ever remembered. To the left of my Human Mage is Saber Gift. That’s right, AFN readers. I decided NOT to cancel this one in favor of Saber Lily. 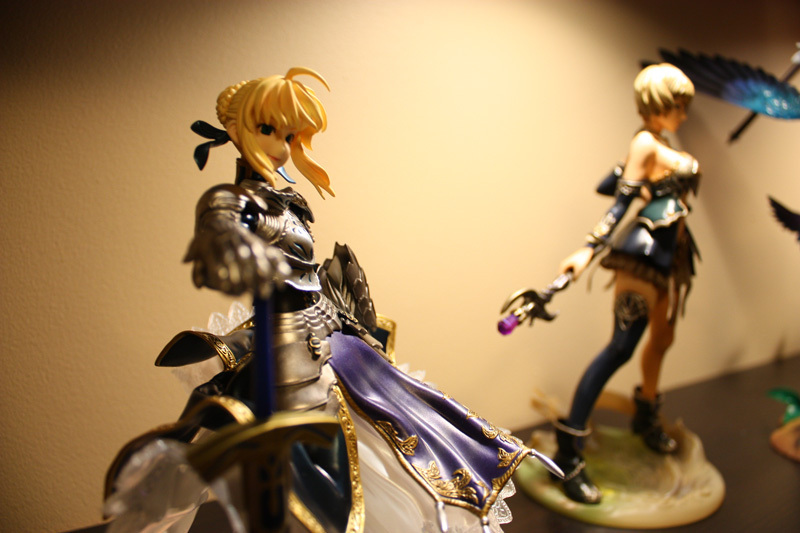 I think when Lily get here, she’ll make an excellent compliment to Saber Gift. I’ve got two Ikea DETOLF shelves in the hallway, and they fit beautifully into a relief in the wall. It’s almost like they were meant to be there. This is my lowest shelf, where I put all my waitresses, and maids. I’d unfortunately have to call this shelf the “Bottom Feeder”. The problem with display shelves is that people rarely look at the bottom most shelf. This is the reason why most of these girls are sitting down. Figures standing up are even harder to see because of the angle. With them sitting down, they cover more space, and as such are more visible. The shelf just above the Bottom Feeder. Currently, the “Goddess” themed shelf, so to speak. Yes, I do consider Sakura Shinguji a goddess, but only because she was a gift from my wife. Truly my very first 1:8 scale figure. 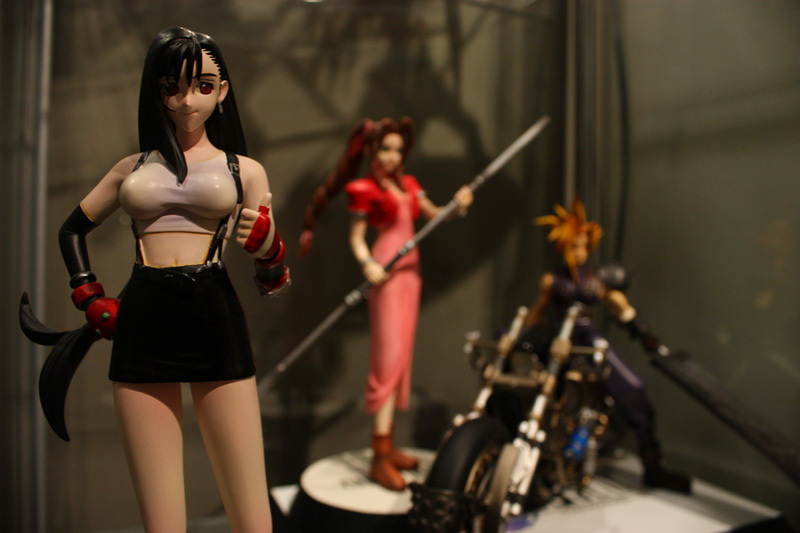 The other 1:6 scale figure is a resin kit that I painstakenly painted and put together. I love it. 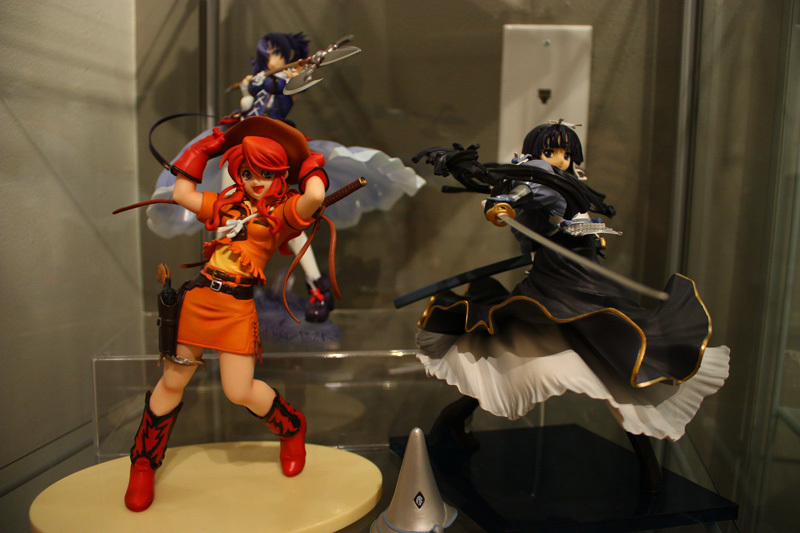 Above the Goddess shelf is the “Quirky Pose” shelf. They’re dynamic, but don’t really make much sense. 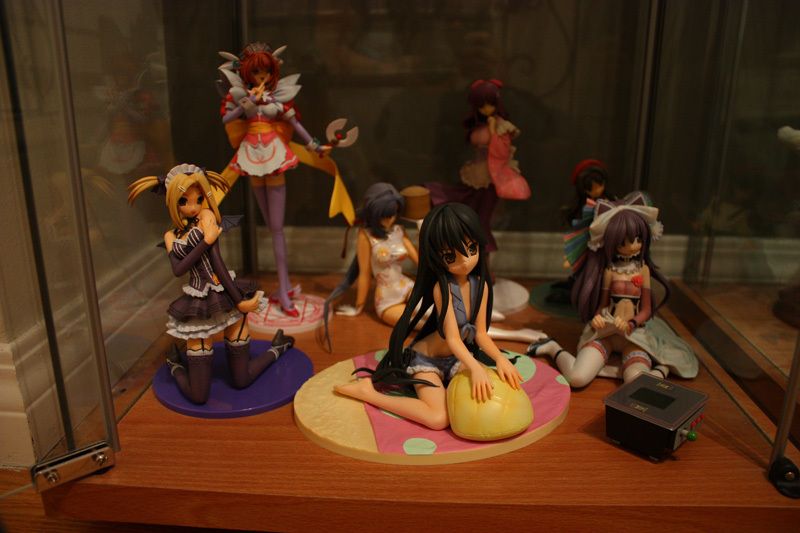 Rize used to be in the Shuraki themed shelf, but a peg broke, as many of you Rize owners may have experienced. Yes, that telephone jack does work. Some of you may recall in my previous Current Collection, the back wall was yellow. I think that painting it this accent dark brown really brings out the figures. 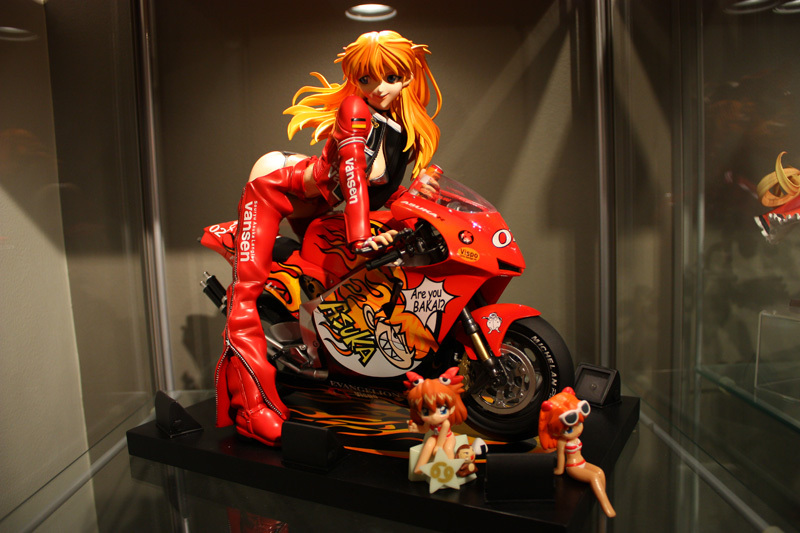 The shelf above the Quirky Pose shelf is my featured Asuka on motorcycle. This baby is supposedly 1:6, but it seems MUCH bigger than that. The detail is astounding. I’m definitely going to do a review on her at some point. My readers deserve to witness the beauty of this one. The two little Asuka gashapons were a later addition. I’ve had them for a while, sitting on my LACK shelves, but never made the connection to put them here. It complements well, I think. Now, onto the DETOLF directly to the right. This top shelf feature is the “Oriental Battle Weapons” theme. Though Shall doesn’t seem to belong in that theme, the pose certainly does! The shelf directly below the “Oriental Weapons” theme shelf is my Final Fantasy shelf. These three are completely cold cast. I’ll do a review on them at some point. The shelf directly to the right of the Goddess shelf, is my “Militia” themed shelf. Guns, guns, and a cute little Alvis Hamilton doing a salute. It can’t get much better than this! This isn’t the end, of course. I still have two more shelves in another room, and another two shelves in the living room which I haven’t covered yet! Stay tuned! very nice collection!, like the way you arranged some themes for your shelves. and nice shelves by the way, like the lighting. your arrangements are the best (because I did the same thing, hahahaha…) I also got Alter’s Ignis and placed her with my Shuraki figures. They just belong in the same shelve. @mangarabbit: Thanks! The lighting is just the default Ikea lights that you can buy with the shelves. @XYZbuster: Good to hear that you’re doing the same arrangements! Ignis totally works with the Shuraki set! @lightningsaber: I strongly suggest you take those boxes out and use them for figures instead… you should do what I do and store your boxes in the closet. It looks a lot cleaner that way. It seems like every figurine collector I’ve seen pics of has a DETOLF shelf. I don’t have the lights though so it’s not as good looking. 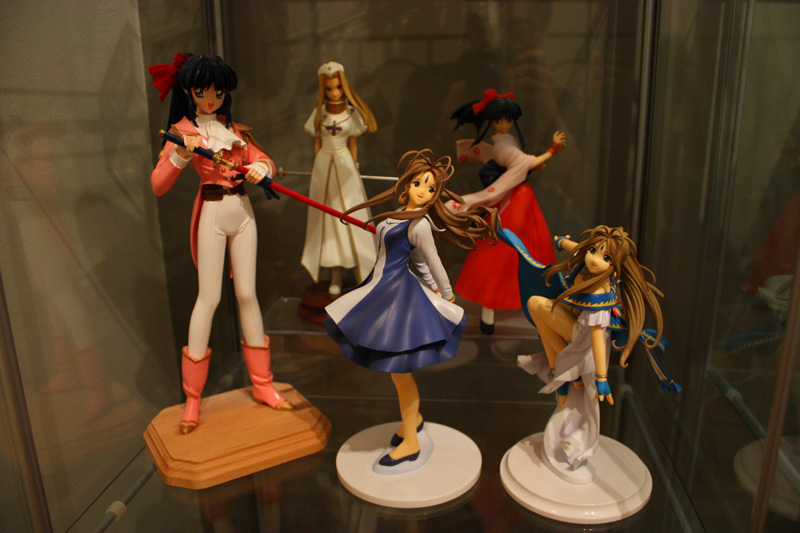 It’s a very good collection and interchanging between your figurines to keep the displays looking new is a great idea! Indeed, Alter’s Gwen is damn nice. 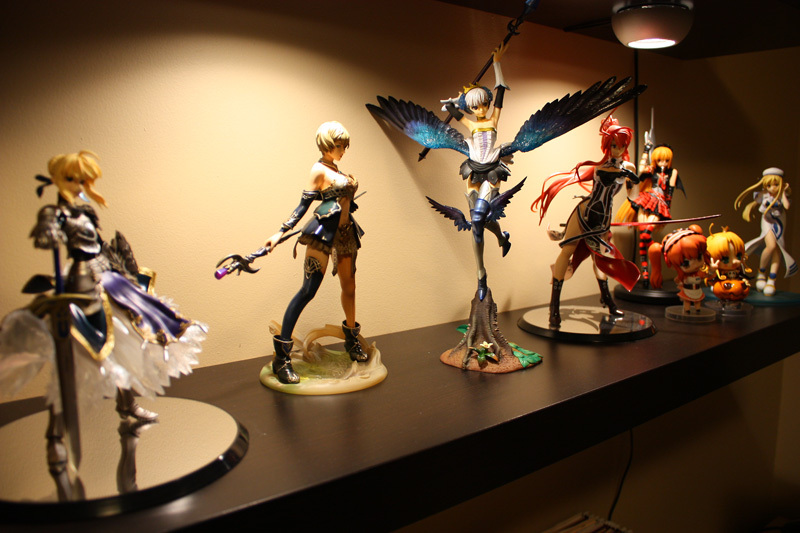 My collection is not showoff-able right now though lol, not fixed lighting for my DETOLF yet. I’m surprised those shelves were from Ikea, they really look great for your figures and that Asuka figure, looks so outstanding. I can’t wait to read your review for it! Is it easy to install the IKEA LACK shelves? Any drilling required other than the lights? @enrius: Thanks for the comment! Stay tuned for more pix in the future! 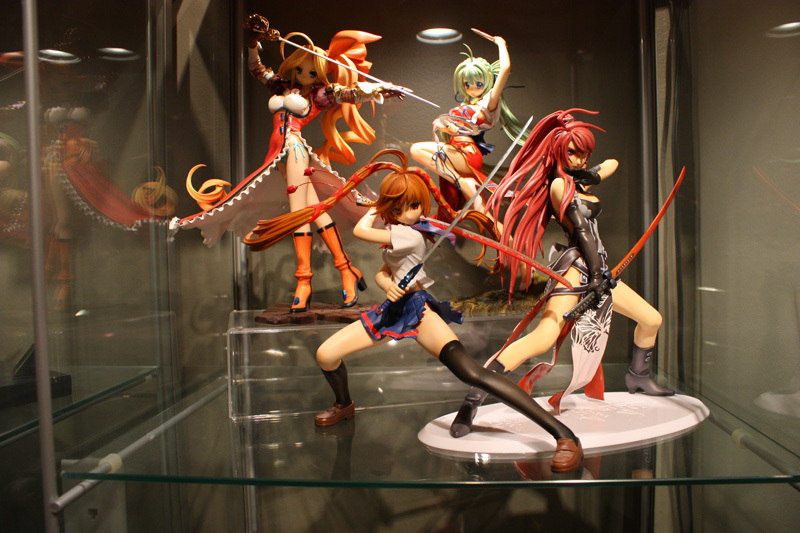 @kin: DETOLF shelves seem like the standard nowadays. It’s just not cool looking enough on a book case, among a background of manga anymore. We are high-end collectors! Installing the lights is super easy, and the lights themselves are only $20 a pair, if I recall. @valho: Definitely will be doing an Asuka in-depth review! @Panther: Hope to see your collection soon! @misakichii: I thought it would be easy to install the LACK shelves, but it’s quite the ordeal. I had a whole description on how it’s done, but I deleted it, because it’s a big pain. Trust me. Asuka is awesome and the more detailed something is the better lol. I hope my collection gets big enough one day where I can cycle them lol. Will need to find a bigger space to store all the boxes though lol, I’m near capacity in my closet :P.
Excellent collection. I know the pain of Rize…one of the pegs broke off ages ago. I’ve got bad luck with pegs, though. Just the other day the peg on my 1/8 Nanaelle snapped off. @puppy52doll: hey thanks! well, I’d love to see your collection of dolls! @Q: Asuka is definitely a beast to dispaly. I’m constantly worried that the case will break one day and Asuka will be no more. I’m STILL buying figures! OMG! @AS: I don’t know if aspiring to that size of a collection is a good idea. I’m here right now, and honestly, it’s not that great. It’s a bit frustrating. 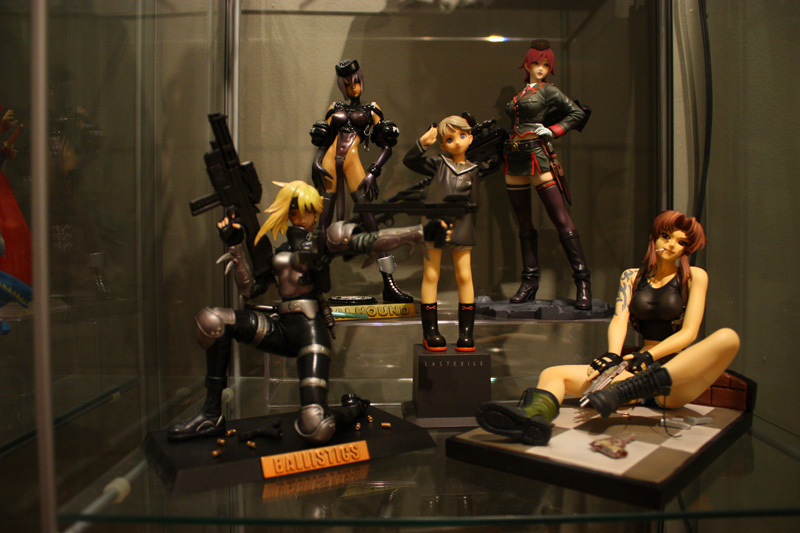 @Anime Figures Toys: Review done! Go check it out! @GK: That damn peg is driving me crazy! I am trying to find some way to repair or replace it, but nothing is available to me! I like the themes you have going on there! Are you using the Ikea Halogen Spots inside your Detolf?I never tried using them due to fear of bending figures from heat. 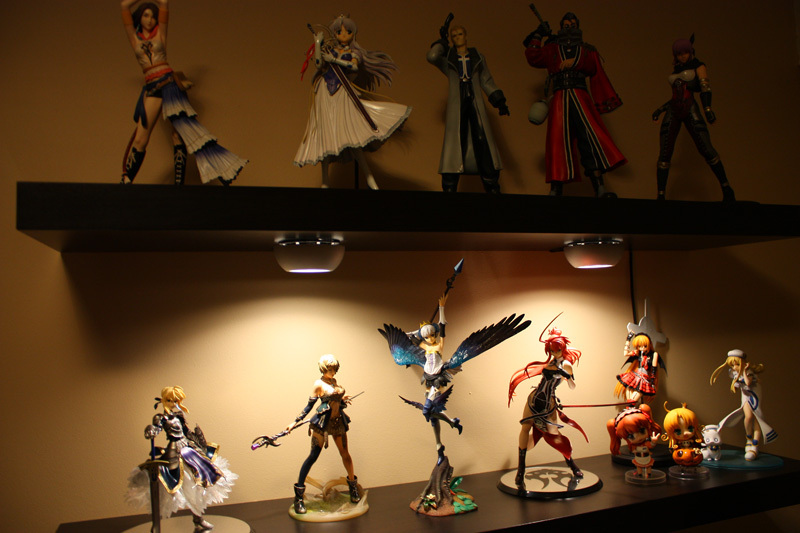 I also use the halogen lamps in my Detolf shelves, but I tend to leave them on for hours. I’ve had this set up for over a year now and haven’t had any heat damage to my figures. Plus the lamps in the Detolf just look so cool. My room almost feels like a museum when I’ve got them lit. It’s relaxing! Ha ha thanks! Yeah, using Ikea halogen spotlights. I usually turn them on only for short periods of time, so I don’t worry too much about it. But you could try it, and feel if the figures get warm. If they do, then it may not be good for them unless you have stable figures that have little chance of leaning, or if you display resin figures on the top shelf. oh gosh! You have a Sakura Shinguji! I love her!